Winter is coming. And with winter, you need some tasty treats to have on hand so you can pop it in the microwave, pour a hot cup of tea, and curl up near the fireplace to enjoy yourself. These cookies will be your new comfort food and then some. 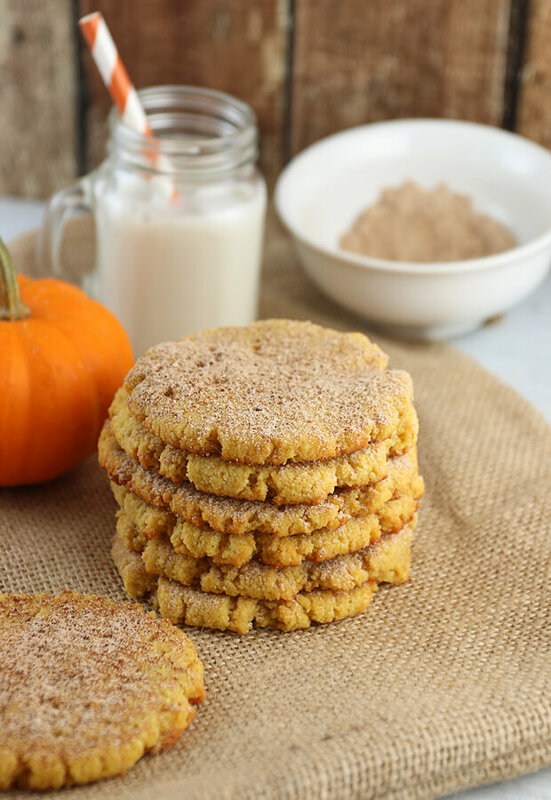 The original Snickerdoodle recipe I made is a favorite of ours. But, it just wasn’t filling the hole we had during these cooler winter months when pumpkin is so in season. 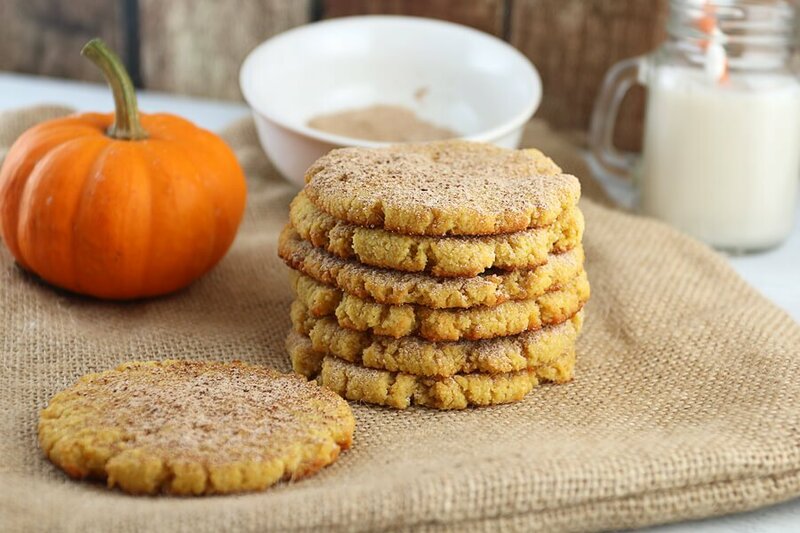 Instead, we combined the best of both worlds – giving you a keto pumpkin snickerdoodle cookie. You really can’t go wrong with this one! 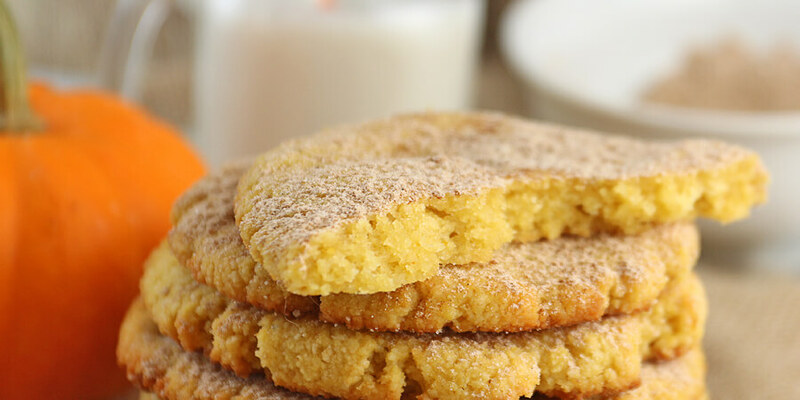 These will become a new family favorite of the season. They’ll go perfectly with Thanksgiving dinner, or you can even bring them to holiday parties later on. Nobody knew that they were low carb when I served them, and that’s the best way to make low carb desserts. These were literally gobbled down within minutes, and people were asking me for the recipe (which of course I kept secret!). Generally speaking, I don’t refrigerate my baked goods the first day that I make them. I let them sit in a container overnight so that they moisture redistributes throughout the treats. The texture gets better the longer it sits out: the cookies gets more moist and have better flavor. 1. Pre-heat oven to 350°F. 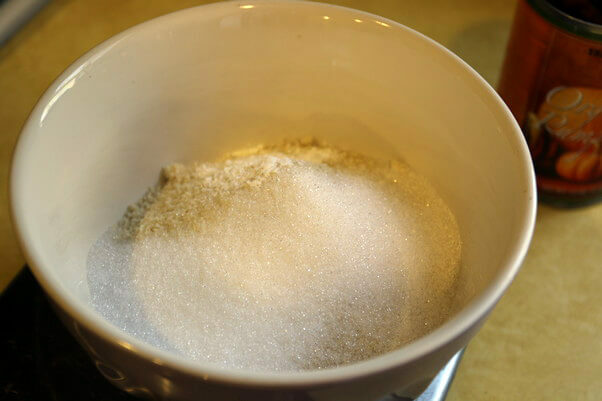 Measure out almond flour, erythritol, and baking powder then mix together well. 2. Secondly, measure out the butter, pumpkin puree, vanilla, and liquid stevia in a separate container. 3. Microwave mixture if needed for easier mixing. 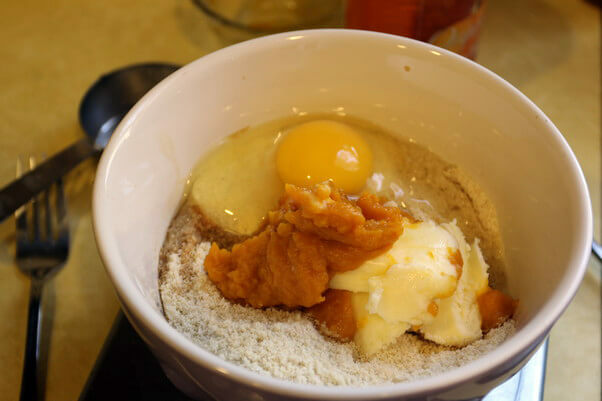 Add all wet ingredients (including the egg) to the almond flour and erythritol. 4. Mix everything together well until a pasty dough is formed. 5. 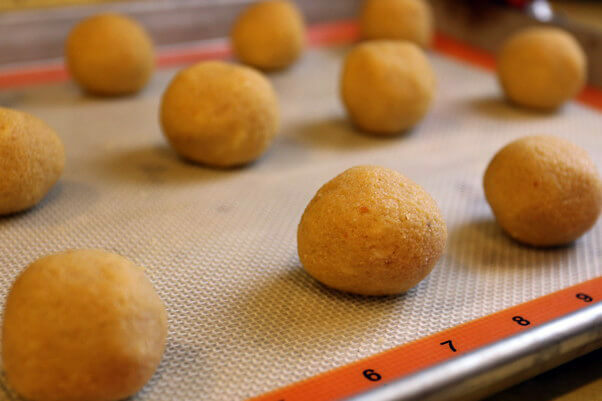 Roll the dough into small balls and set on a cookie sheet covered with a silpat. You should have about 15 cookies in total. 6. Press the balls flat with your hand (or the bottom side of a jar) and bake for 12-13 minutes. 7. While the cookies are cooking, run 2 tsp. erythritol and 1 tsp. 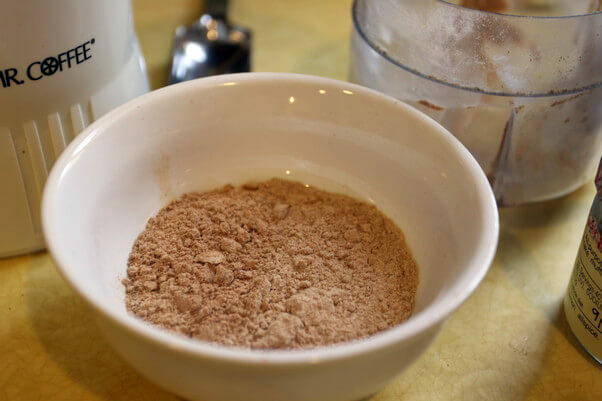 pumpkin pie spice through a spice grinder to powder the erythritol. 8. 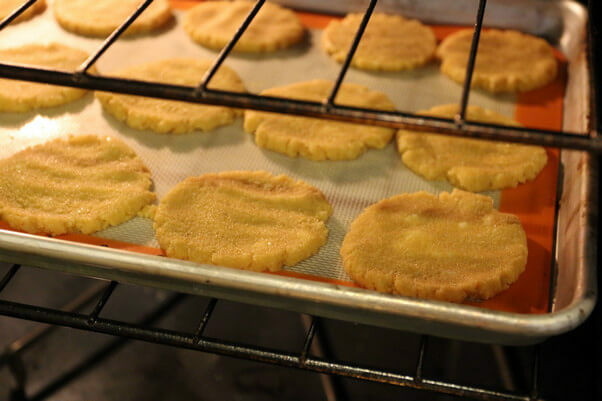 Once the cookies are out of the oven, sprinkle with the topping and let cool completely. Pre-heat oven to 350F. Measure out dry ingredients and mix. 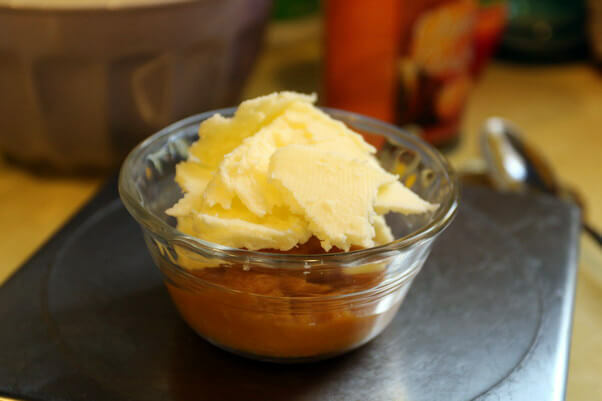 In a separate container, measure out the butter, pumpkin puree, vanilla, and liquid stevia. 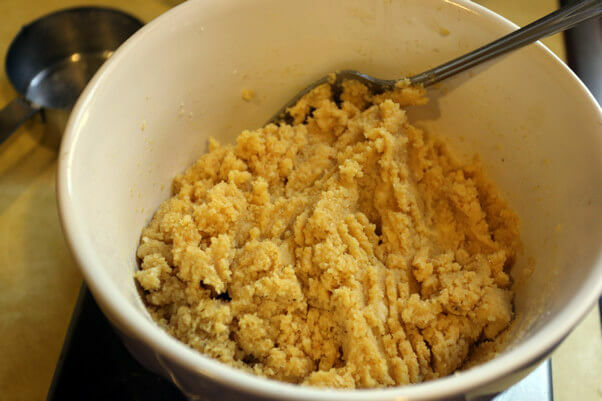 Mix everything together well until a pasty dough is formed. Roll the dough into small balls and set on a cookie sheet covered with a silpat. About 15 cookies in total. Press the balls flat with your hand (or the bottom side of a jar) and bake for 12-13 minutes. While the cookies are cooking, run 2 tsp. erythritol and 1 tsp. pumpkin pie spice through a spice grinder. Once the cookies are done, sprinkle with the topping and let cool completely.